PVC pipe has been cut, 10-gauge wire wrestled, fantastic fans flipped open, closets pulled apart, and more. Is this madness run amok, or mod contest winning? Welcome to the March 2016 Monthly Mod Contest. Please review the following twelve Medium Mods and vote for your favorite. We will announce the March 2016 Mod Contest winner next week. For more information about the Monthly Mod Contest, including how to enter, click here. I carry two full size bikes without having to have a hitch mounted carrier or put my bikes inside. 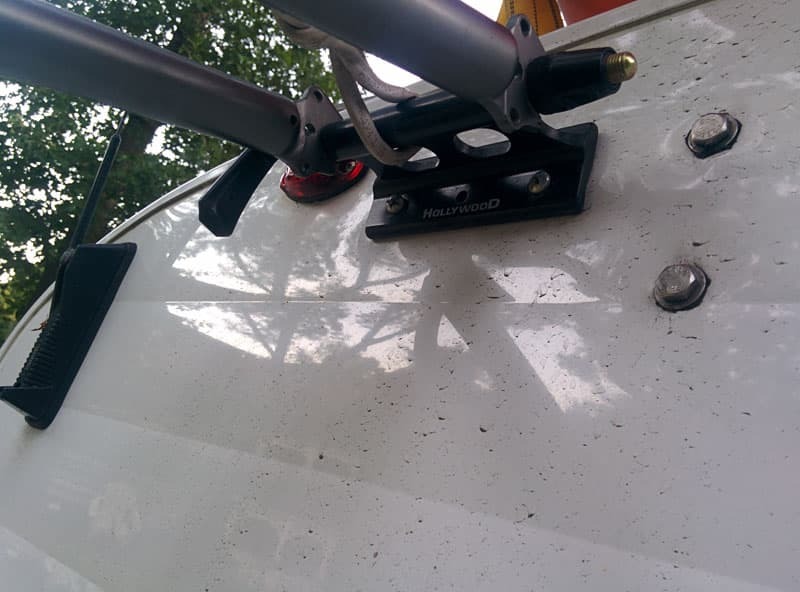 I installed bike fork mounts to the rear of the camper. 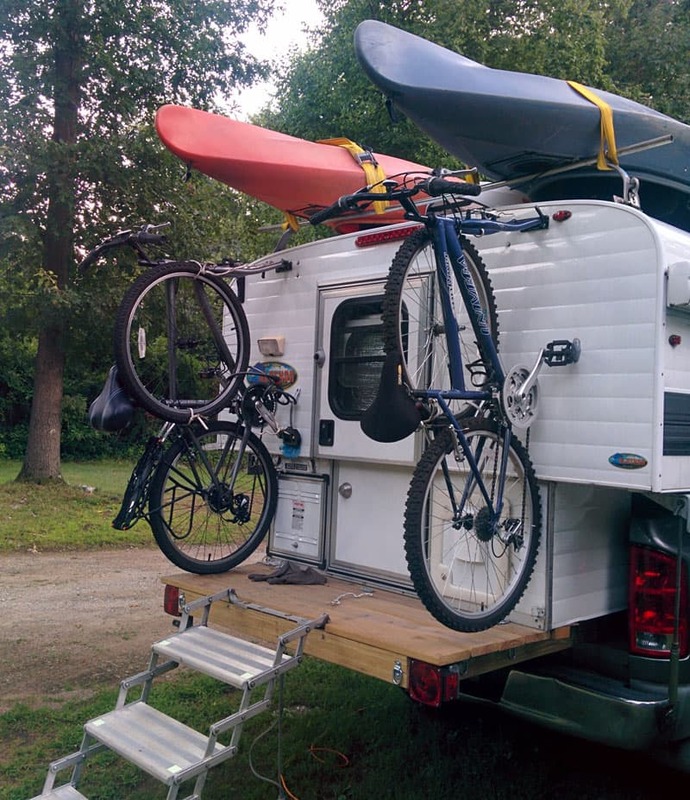 I can safely carry two bikes on the back of the camper without the use of a hitch-mounted bike carrier. The bikes ride up high on the camper, one on each side. 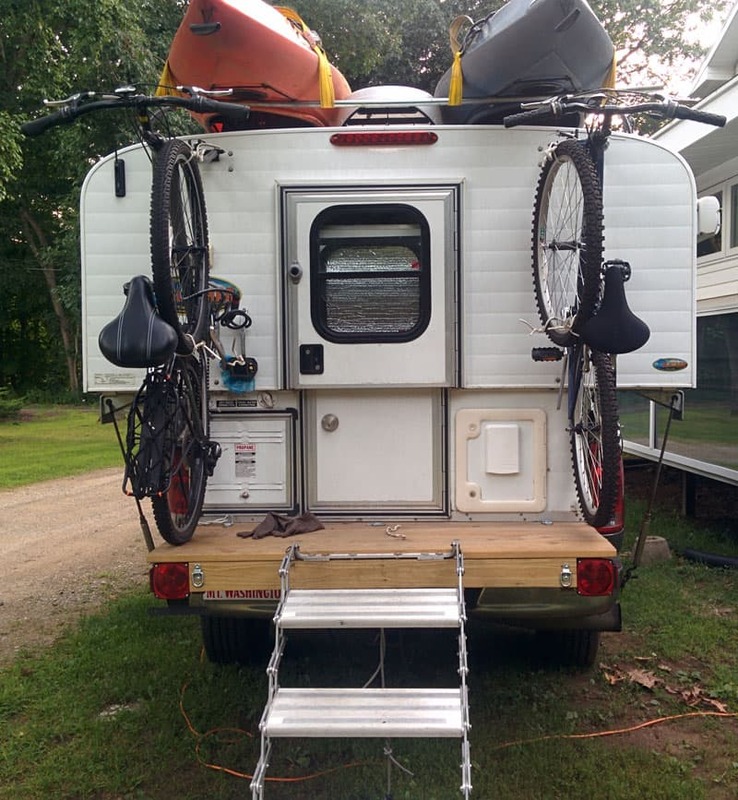 I can still enter the camper with the bikes mounted. I can also raise and lower camper without removing bikes. Mounted this way, the bikes don’t get all the bugs or road grime. An expensive swing away carrier is not required. The bikes are easy to load from the stairs or platform. It took me one hour to complete and cost $50. In my opinion, the skill level of this mod is easy to medium. Campers never have enough storage in the kitchen, so we added some counter top storage in the kitchen and a toothbrush holder in the bathroom. In the kitchen, we are able to keep the large cooking utensils on the counter, even when we are driving down the road. Since the utensil holder would never stay in place in motion down the highway, I fastened it to the counter top. I mounted a post in the countertop 3/4-inch high and 5/16-inch in diameter. I used a wood screw with a long nut for the post, but a short piece of tubing would also work. 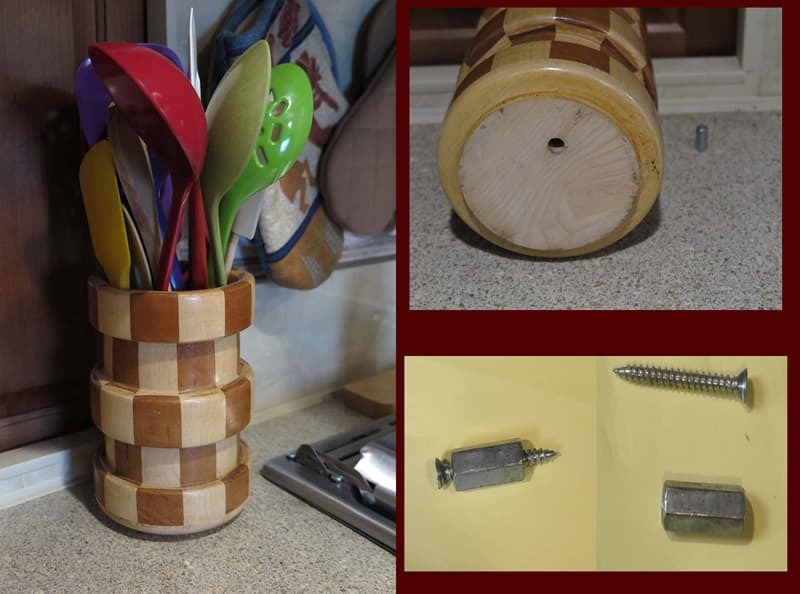 Next, I drilled a hole in the utensil holder the same size as the post on the counter top. I slide the holder down over the stud and fill with spatulas, spoons, scrapers, or whatever. The holder is easily removable for counter cleaning. Since the hole in the utensil holder is a snug fit on the stud, it stays in place even on the roughest roads.